I sent this message, and then I dropped the shotgun in question on the floor of the cave and awaited a reaction. My 19-year-old daughter and I were wandering through the Zaford’s stash cave during the Clan War mission of Borderlands 2, so it’s totally okay for me to be giving my teenager a shotgun by throwing it on the floor of a cave. Video game shotguns can take a lot of abuse. The color-code on this shotgun was orange, which meant it was from among the very rarest and most powerful class of items. When you see an orange item, you jump on it, so of course Kiki snatched it up, pulled up her inventory screen, and then messaged me back. 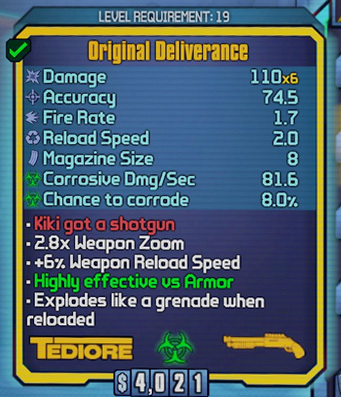 “Kiki” is my daughter’s online nickname, and by happy coincidence this particular weapon had flavor text associated with it : “Kiki got a shotgun.” When the player reloads the weapon, she will throw it, but instead of tumbling away and exploding like some other magical Borderlands video-game guns, this one will point itself at the nearest enemy and fly towards it, firing as it goes. The flavor text encourages you to imagine what it would look like if a witch on a broom had a shotgun. Oh, and when it flies away a new copy of the gun materializes in your hands, beamed there from your storage deck because video game science fiction is a lot like magic. But that’s not really the salient point. See, ultra-rare items show up in chests or loot drops with such tiny frequency that the average player might not see one at all during 20 hours of play. Most players spend dozens of hours grinding their characters up to high levels, and then gang-raiding boss monsters over and over in hopes of an orange drop. And even then, unless they’re doing this during the level-capped “Ultimate Vault Hunter” playthrough, the item is going to be several levels lower than they are. A low-level rare item doesn’t do much good against high-level enemies. It is unusual, then, for someone to hand another player an ultra-rare item that is leveled perfectly for their character. I’ve done it dozens of times, because I’m a filthy cheater. See, from one perspective, the Borderlands games are all about finding new weapons, shields, grenades, and artifacts so your character can face higher-level enemies as you move through the game. Play runs like this: navigate through the level until there’s a fight, have the fight, then stop for five minutes and compare the loot drops to the things already in your inventory. In single player mode this is kind of fun for a while, but in multiplayer mode it quickly gets boring. From my perspective, the Borderlands games are about teaming up with my kids to kill things in an imaginary world of endless violence, experimenting with play styles and team strategies while laughing at the things our characters say as they interact. Stopping every five minutes for loot comparison crimps the mirth. So I got my hands on an editing tool for our save files, and solved the problem. The editor has a button that will bring all the items in my inventory up to my level, which means the super-cool stuff I found back during my level 10 slog is still super-cool when I’m level 35. It will let me duplicate items (I did not give Kiki my only copy of that shotgun), and I can even create items in my inventory—items that would exist legally in the game, but which I’ve not yet come across. Better still, the editor will let me clone elements from one character’s save file and build a brand new character at whatever level or game stage I want, so that I can, for instance, jump online with my daughter and join her level 25 quest without grinding for eight hours to create a level 25 character first. The Borderlands games do not have a difficulty setting. If they’re too difficult, you are expected to practice more, or grind for hours in order to find more effective weapons, and usually the player must do both. There are hard-core players who have done exactly this, and who have hundreds of hours of hard-fought game play invested in a single character who has lots of cool tools. And I expect that some of those players resent the fact that people like me exist. I have a dozen different characters, and they ALL have cool tools, and while I also have over a hundred hours logged in the game, I certainly haven’t “earned” the collection of rare and ultra-rare items these characters field. So what? When my daughter said “oh Daddy. I love this!” I felt like I had TOTALLY earned that moment. I also earned the four hours she and I and my youngest son got to spend together one Saturday, engaged in a quest that would have been eight levels too high for her, except I leveled a copy of her character and inventory from 25 to 32. Kiki is coming home from school in a couple of weeks, and I suspect there will be lots of Borderlands mayhem spread across the screens in my house. There will be laughing and shrieking and cheering, and maybe we’ll pause for some loot comparison when something cool drops out of a boss piñata, but whatever happens I’m looking forward to it, and I’ll have the editing tool handy in order to make sure that we all get to play the game we love. 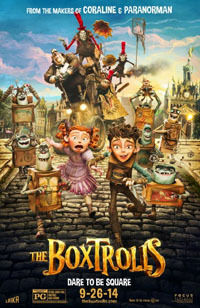 The Boxtrolls is quirky, funny, dark, and a little disturbing in all of my favorite ways. I enjoyed it, but I can see lots of places where folks might not think it’s their thing. Then again, there are probably other folks who will love it a lot more than I did. It comes in just a hair below my Threshold of Awesome. It’s dark for a kids’ movie, but it’s definitely a kids’ movie. You can tell because all the adults are either evil, disinterested, or too stupid to help, leaving our young heroes in charge of fixing things themselves. A trope, yes, but handled in ways that I found very satisfying. Did I mention that this film is beautiful? Oh, my. I don’t even know where to start. Even the ugly bits were beautiful. This is one that I may want to own on Blu-Ray just so I can freeze scenes and stare deeply into the designs. On that note, though, the poster above does it a great disservice. It hints at some of the energy of the film, but fails completely to catch the spirit or the beauty of it. Lock In, by John Scalzi breaks a couple of big rules, but gets away with it quite handily. It’s near-future science fiction in which a plague has created a whole new class of people whose minds are in fine shape, but who have no ability to move their bodies. They’re “locked in,” and as the prologue (okay, THREE rules) tells us, the fact that some very high-profile people get locked in results in hundreds of billions of dollars in emergency research, several breakthroughs, and a cool system whereby these folks can function like normal people — they teleoperate robot chassis, and yes, this causes some societal upheaval. But that’s the prologue, and I’ve left lots of stuff out. The story itself is part mystery, part sci-fi police procedural, and part technothriller, and covers a lot of ground in some very efficient words. It’s fast-paced, and I found it really engaging from the beginning all the way to the end. The book felt kind of thin on descriptions. 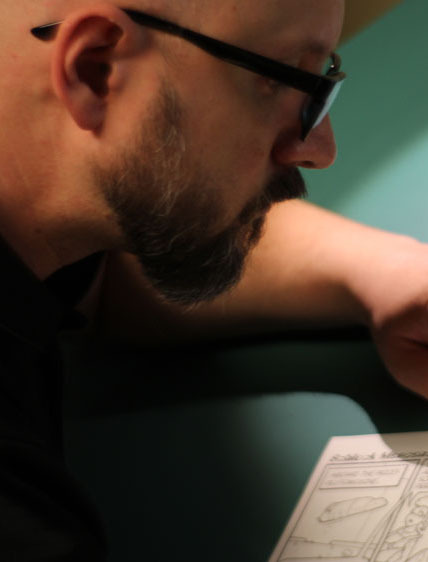 It’s not quite white-room, but it depends heavily on the fact that the readers can be depended upon to fill in a lot of blanks with their own experiences — something readers are going to do anyway, really. It’s near-future SF, so it’s not much of a problem, and Scalzi gets away with this on the strength of the book’s pacing. Rich descriptions would have broken the pace, and besides, he describes the important stuff. The big issue for me was that the main character did not have a compelling arc beyond getting the mystery solved and keeping his new job. I gave this a pass for a couple of reasons: first, the story is more of an Idea and Event story than a Character story. Second, the main character is a Lock In, and the fairly shallow character arc makes him seem normal compared to the people around him. Sure, he wants the same sorts of things that you and I want, but he’s not a cop on the edge, or a rookie with a dark secret, or any of the other plot-shortcut tropes. So I guess it’s not a big issue. It only came up when I got to the end and realized that although the end was satisfying, the main character’s journey wasn’t really about him at all. The book has already been picked up for a TV series, and I think that it’s kind of perfect for that. There are plenty more stories to be told in the Lock In universe, and they’re good, thoughtful stories that a competent screenwriter can wrap up in 43 minutes, or can wrap a season of 43-minute episodes around. Obligatory Disclaimer: The Maze Runner is based on a novel written by my friend James Dashner. I have a policy about reviewing books, which basically says I only write a review if the book is one that I can recommend. Movies, though, I’ll review if I’ve seen it and have something to say. 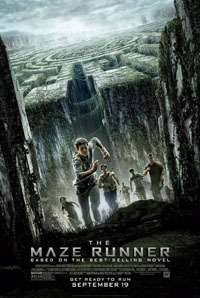 The Maze Runner (movie) is a pretty good character drama with science-fiction thriller elements in it. I enjoyed it, but it didn’t clear my Threshold of Awesome. Why not? Well, because it’s not my kind of story. And here’s where my policy kind of trips me up — I think that The Maze Runner (movie) is a very faithful adaptation of Dashner’s best-selling novel, but the novel itself isn’t really my thing, mostly for stylistic reasons, and now I have to tell you about a book I don’t actually love. I think that the conceit of the maze itself, in which a tiny community of young men and boys is trapped at the maze’s center, is super-cool and very engaging. The film brings the maze to life in ways that fans of the book will probably love, and though the events of the book are necessarily compressed, the film gets those right, too. But I don’t love the style of storytelling in which volumes of new information are dropped on the reader or viewer right at the end. Sure, in real life there’s not much foreshadowing for things that are unexpected, but that doesn’t satisfy me in a book or a movie. I want “surprising yet inevitable,” not “whoa, where did THAT come from?” I like the final twists and reveals to be easily explained in one or two sentences in which everything comes together, rather than long explanations which raise as many questions an they answer. I also love settings that fully explore the ramifications of their “what ifs,” and The Maze Runner doesn’t really do that. There’s a little bit of a Lord of the Flies feel to the glade in the center of the maze, but the glade is nothing like what I imagine an all-boy subsistence community to be like, especially not with the arrival of a girl. But hey, I had the same problem with The Hunger Games, and those books and films have entertained a lot of people. Your mileage may vary, and now you have one of the key points of variability.